THE WORLDS FIRST AND ONLY LED PROFESSIONAL Fiber-optic OTOSCOPE! Prepare to be amazed at the clear, bright, unobstructed view it provides, using an LED light source, and a Fiber-optic bundle to distribute the light. Nothing else is comparable, even among the most expensive of the "premier model" otoscopes. The Pro-Physician LED Fiber-optic Otoscope is the finest available, without regard to price! PLEASE NOTE that this is the latest model , BRAND NEW, and of sturdy chrome-plated brass construction. It contains a large diameter lens with the optimum 5X magnification that is of optical quality and made of a scratch resistant GLASS. Many of the lesser quality otoscopes contain acrylic lens that will easily scratch with use over time. The lens is hinged and swings aside for cleaning and easy access. It also has an all metal insufflation port for reliable testing of tympanic membrane mobility using an insufflator bulb. 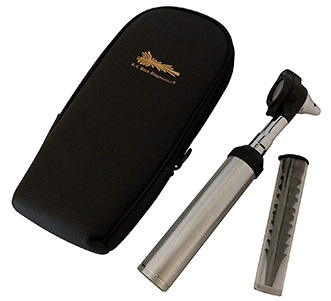 The energy efficiency and durability of this otoscope is simply amazing. The LED light source has no filament to break like a conventional incandescent powered otoscope. The LED bulb is virtually indestructible and is warranted for life to never go out. You will be amazed by the amount of light created by the LED bulb. The light produced by this otoscope is full spectrum white light and not the yellow light typically created by incandescent light bulbs on other otoscopes. With a light emitting diode there is no fragile filament to break so it can withstand repeated dropping or rough handling. The bulbs found on other otoscopes burn very hot and eat battery power, they are also somewhat fragile, and can be broken when the otoscope is dropped or handled in any rough manner. The special bulbs in some premier otoscopes cost thirty dollars each, and aside from failing when dropped, they burn out after a time, just from ordinary usage. Of forty-two doctors surveyed, each of whom has used our LED Fiber-optic Otoscope over a period of at least three months, all but two have learned to prefer it, even to their wall mount models. It should also be noted that our LED otoscope uses uses a fiftieth of the power of a otoscope meaning an ordinary set of C cell alkaline batteries will last for many months. Our otoscope can also make use of C cell rechargeable if you prefer. Buy two sets and you will never be without power to your otoscope. The same can not be said for that very expensive brand that uses a specialized rechargeable battery located in it's handle. When depleted the handle must be removed from the otoscope head and stuck in an electric socket to re-charge making the otoscope inoperable until the charge is complete. If you forget to stick the handle in the wall to re-charge the night before you are then without an otoscope the next morning. Our Otoscope has been re-designed for better balance. We extended the neck so the otoscope is perfectly balanced at the point it would be held in your hand while doing a traditional otoscope exam. 30 Day Money Back Guarantee - No risk trial of your Pro Fiber-optic LED Otoscope......We are so sure you will love having your Pro Fiber-optic LED Otoscope we offer 30 day money back guarantee. If you are not happy with your otoscope just return it anytime within 30 days for a complete satisfaction guaranteed refund.